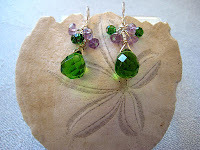 This amethyst and green earring is what I made this weekend. The green quartz has such a beautiful hue. First I thought it was peridot. But no, it has a mint and olive mixed tint. And it is called prasiolite. Wow! what a mouthful name. PRASIOLITE, kind of pretty and classy, isn't it? It is also called green quartz, the vendor in the Gem Show explained. I decided to get it any way because it is highly faceted, and beautiful. I did get some blue ones too. They are very pretty too. But let me tell you about this earring. As I was playing with these two tear drops in my palm, I thought of the purple amethyst beads I had also. Purple and green together looks so good to me, and it reminded me of the wisteria tree I have. The amethyst beads looked just like those violet wisteria flowers playing hide and seek with the green leaves. Any way, coming back to my earring this Sunday, here it is. I was going to make it longer, but then I thought it is very romantic when it just brushes the jaw line some times. There is a lot of loveliness in this cute earring piece. The gemstones are so gentle and protective, as if they will hold the wearer's face with much love, and take care so that no harm can come to her. Oh yes, that is what I learned reading several healing stone books and from respectable sites. Green quartz transmits negative energy to positive, inspires creativity attracting wealth and abundance. Amethyst guards against psychic attacks , geopathic and electromagnetic stresses like envy, or ill wishes of others. So, wouldn't it be a wonderful thing for Valentine Day? What do you think? Oh I should also show you the one with the blue quartz. Which one do you like better, blue or green? What beautiful work you do! 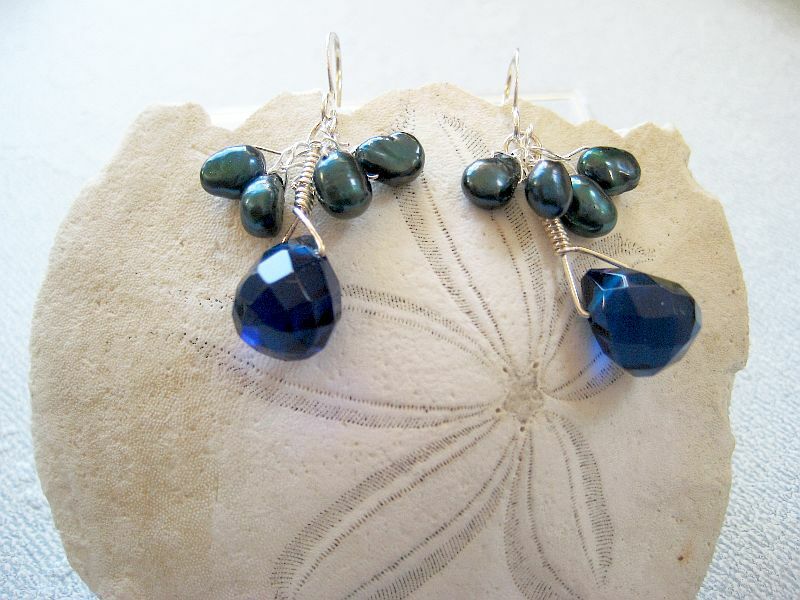 I prefer the green earrings although the blue is pretty as well. Thanks for dropping by my blog, and for your kind words about the resin pendants and rings I made. Beautiful earrings and wire work. I'm just blog hopping along on the Bead Soup Blog Hop list. Whoo Hoo, nice group and you have a great blog! Beautiful! And I've heard prasiolite called green amethyst before, too! Standing alone I prefer the green ones, I like the combination a lot - and indeed it looks like your wisteria tree! The blue ones might be my favourite as accessories - if you match them with a perfect top they will be the most elegant things ever! Jewelry Tools- Three Absolutely Necessary Ones..